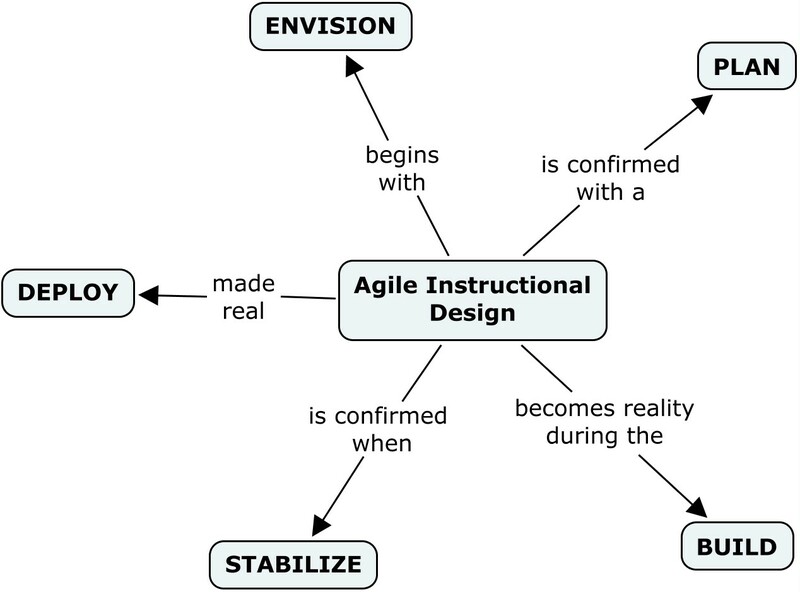 A while back I wrote a post that elaborated on the flowchart I had embedded in a paper on how I envisioned Agile Instructional Design (AID). As I wrote the post I realized there was way to much information for a single post. I provided a high level description of the AID flow within this first post with the promise to provide detailed descriptions of each step in later posts. This post describes in detail the activities performed and outcomes desired from the ENVISION step of Agile Instructional Design. ENVISION - this is the process of envisioning the curriculum of the lessons, the courses or the whole program. Envisioning is more big picture, though it does require rigor in understanding the content, context and outcomes for the learning. It is important to build a comprehensive understanding of the knowledge domain, its current innovations and how it fits with related and connected knowledge domains. The struggle with this first step is there is no waiting until it is finished before people can start learning. People should start learning as soon as the general direction is known. Envisioning iterates with the other steps and what is learned from subsequent steps adds to the envision step. From an individual learner perspective this should be done by the learner with input / feedback from their learning network. Form a community of practice or peer learning group it should be done through discussion, collaboration and engagement. From the institutional perspective this should be done by a librarian and the subject area experts should fulfill the SME role. Outcomes: Mind Map / Concept Map, Drawing or creative works, listing of keywords for knowledge domain. 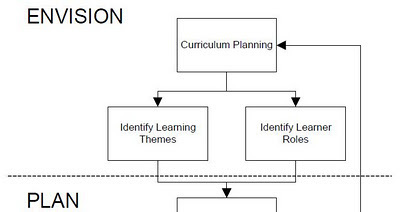 What the group or individual responsible for curriculum planning believes is the best way to capture the information. Identifying Learning Themes is about creating a hierarchy of outcomes where the high level outcomes are the learning themes. 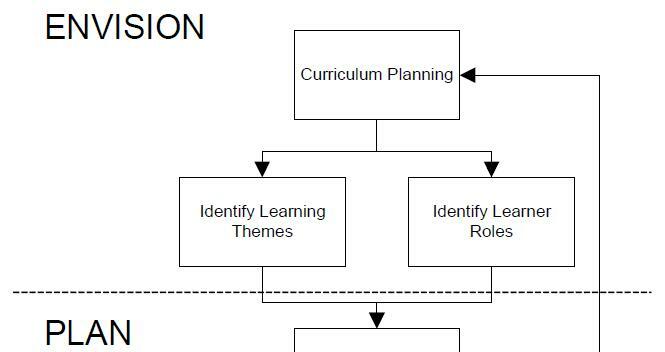 This can be well done within a Concept Map where the group (or individual) tasked with identifying the learning themes would build the Concept Map. The hierarchy doesn't need to be a single headed hierarchy. If you were setting out to learn about AID the main themes would be the five steps within the AID methodology (Envision, Plan, Build, Stabilize and Deploy). Learning themes also are about finding the stories and anchors to ground the learning into problem based and real world situations so all learners can stay connected to the content. Outcomes: Elaborate on the document / drawing / artefact created during the high level curriculum planning. Learning themes may be documented as additional stories or highlights. Identify Learner Roles is about audience and context. Identifying the audience for learning is very important, for they will dictate the literacy levels, the breadth of knowing, the audience determines the appropriate stories and anchors. It is also important to identify the roles from all sides of the learning engagement; learner, facilitator, teacher, peer, subject mater expert, etc. And giving the roles human names, descriptions, and avatars will help learners to connect to the roles and the stories they participate. Context also has a big influence over stories and anchors. Is it professional development or graduate level academics? Is it in an urban surrounding or rural? Is the learning building on previous learning? Outcomes: User role descriptions. These could be cards or full pages describing each role with details of breadth of knowledge, background, role within the learning experience. To a certain extent ENVISIONING is the brainstorming step of Agile Instructional Design. It may be worth considering alternative approaches when envisioning a new curriculum. Many new approaches exist for getting people together to discuss things that matter. Curriculum development matters, particularly when put into the context of global or community change. One particularly effective approach is the World Cafe. I suggest exploring this approach to discovering a shared curriculum.